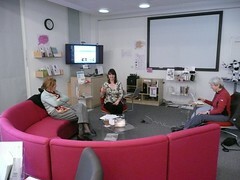 DigiLab discussionOriginally uploaded by openpadThe Open University Library has developed an area known as the DigiLab as a drop in space to look at and use new technology. Recently we have used this area for a couple of discussions and I feel it could offer a model for how people could work in the future. 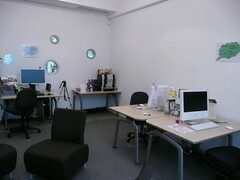 There is comfy area where you can hook up to large screens or just plug in laptops, behind that a small table and chairs plus two small work areas and a more powerful media area. Finally there is a coffee machine. In one of our sessions other people came in and had a separate chat – without either group disturbing the other too much. Can this map on to out new building? I am not sure. Trying to do it at a small scale may well not work as it means that we have to sacrifice individual space to create shared space and if only a few people do that the result is just their loss! As part of open university, open content and open learn is it right that I am starting to get some cold feet about going open plan? The bit of the OU that I am in (Institute of Educational Technology – IET) is housed in an old style set of offices off corridors and I am not too attached to it. So I have been fairly calm about change thinking that what we might lose in privacy we would gain in better communication and space to show off to visitors. The building itself (Jennie Lee Building – JLB) looks ok and the lab areas and way the public spaces work sounds quite good. But and it is a big but the actual areas for people to work in are just too small. In current drawings these are then filled with as large a desk as possible and as much storage as can fit in to try to fit us all in. The result fills me (and not just me) with a feeling of impending doom. On the other hand I am not precious about what we have got and, before it is too late, I think we need to do something radical to rescue the situation. I know at the beginning there were some great ideas floating around and those have probably been priced out or pressured out by too many people needing to go into the building. What I think there might be scope for is to take at least a bit of the building and treat it differently by thinking through what we want out of a building in the academic world. Suggestions from me – are no desktop machines, shared book space, comfy places to sit, easy places to plug in and display, plenty of informal meeting areas. If moving into the building can reduce time spent in one hour meetings when 10 minutes will do, switch from staring at email to working jointly to achieve things, and to connect up with the great people who work here then I wouldn’t mind losing my cell. If it doesn’t deliver on that then I suspect the building might be less than busy and in the end those who turn up might well get enough space. Just not sure if I will be one of them.